Two senior political figures have called for an inquiry into claims that police have targeted and assaulted disabled people taking part in peaceful anti-fracking protests. Both the co-leader of the Green party, Jonathan Bartley, and Labour’s shadow chancellor, John McDonnell, have called for an inquiry into the actions of Lancashire police. Bartley said he was “incredibly concerned” about what he had been told, and that it was clear disabled people had been “abused” and were being subject to discriminatory treatment by Lancashire police. He has called for an independent inquiry, after Disability News Service (DNS) reported concerns last week about police actions at protests across the country and particularly one focused on the drilling activities of the energy company Cuadrilla at Preston New Road, on the edge of Blackpool. As well as disabled people, protesters believe that older people, women and younger people have also been targeted by police. McDonnell, although not available to speak to DNS this week, has spoken of the need for an inquiry into the “unacceptable” level of “physical force” that appears to have been used by Lancashire police. The shadow chancellor, who has visited Preston New Road, says in a film about the targeting of anti-fracking protesters, produced for the Netpol police monitoring network by Gathering Place Films, that he was shocked by what he had heard from protesters and had seen in video footage and was “really worried about the physical nature” of the policing. He says in the film (pictured): “I think there is a need for an inquiry of some sort into what’s happening with the policing operation overall. Bartley has also visited Preston New Road and has spoken to disabled people and other protesters. He told DNS this week that he could not prove that disabled people were being deliberately targeted by police officers, but that there was “an awful lot of circumstantial evidence that it is happening”. And he said there needed to be an independent inquiry into what had been happening. The Independent Office for Police Conduct (IOPC) said this week that it had no current investigations into the actions of Lancashire police at Preston New Road, but that it was continuing to “monitor the situation”. But Bartley accused the IOPC of being “mealy-mouthed” and said its statement was “a cop-out” and that action needed to be taken before someone was seriously injured. He also said Lancashire police needed to make it clear the steps it would take to ensure the safety and rights of disabled protesters were protected. And he said there was “ample evidence” to show that the force was not currently doing that. Despite the call for an inquiry by McDonnell, Lancashire’s police and crime commissioner, Labour’s Clive Grunshaw, has backed the force’s tactics and has told DNS that he is “reassured that the tactics available to officers and used on the ground are all in line with Home Office and College of Policing guidelines”. He said he did not support the call for an independent inquiry into the policing tactics. He said: “Officers react to situations they are faced with and respond in a legitimate and proportional manner. 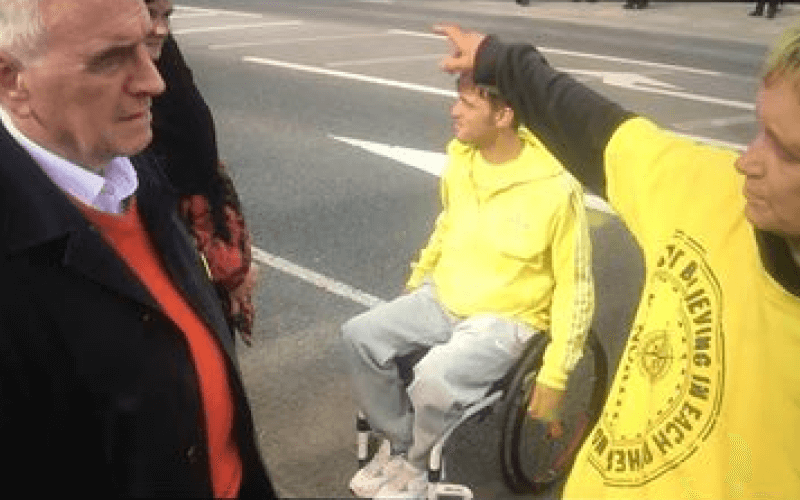 DNS spoke last week to three disabled protesters, and two other eye-witnesses, who all experienced or witnessed serious and repeated incidents of police brutality targeted at disabled people taking part in the Preston New Road protest. Disabled protesters have described being kicked, punched, knocked unconscious, and tipped out of their wheelchairs. One of the disabled protesters Bartley has spoken to, at another fracking site in Lancashire, is veteran Green party member Anne Power. Video footage shot by protesters, and reported by the Independent last year, showed Power, who is in her 80s, being dragged across a road by police officers while protesting peacefully outside the site near Little Plumpton. Bartley said: “I know Anne, I know her character, I know her integrity, her honesty. Bartley, who himself was pushed to the ground and then dragged along a road by police officers while trying to deliver a speech at an anti-fracking protest at Kirby Misperton in Yorkshire in November 2017, warned that the events in Lancashire and at other anti-fracking protests needed to be put in the context of other attacks on the rights of protesters. He pointed to the anti-terror laws used against the Stansted 15, and the 15- and 16-month prison sentences imposed on the Frack Free Three (protesters at Preston New Road, whose sentences were later quashed on appealed). Bartley said a pattern was developing of the views of local communities “being ridden roughshod over” and then their democratic right to protest being taken away. He said: “There seems to be a concerted effort across the board to clamp down on protest. And he said he would not be surprised – once parliament had settled the Brexit logjam – if the government brought forward “even stronger laws that take away people’s civil liberties further”. There are fears that forces across the country that have policed anti-fracking protests are developing a tactics “template” that can be used to target disabled people taking part in other peaceful protests, such as those organised by the anti-cuts and climate change movements. Last week, Andy Greene, a member of the national steering group of Disabled People Against Cuts, warned that there had been an “escalation” and a “clear direction of travel” in police tactics since the anti-fracking protests at Balcombe, in Sussex, in the summer of 2013. He said police tactics were becoming “more physical… more confrontational, more provoking” and that he expected these police tactics to be “rolled out across the protest movement” over the next year as the country sees a likely increase in political volatility around issues such as anti-fracking, anti-austerity and Brexit. Grunshaw said in a statement: “The policing operation on Preston New Road is in place to ensure public safety on what is a very busy and vital route and I am reassured that the tactics available to officers and used on the ground are all in line with Home Office and College of Policing guidelines. “Officers at the fracking site are caught between competing demands of facilitating peaceful protest and allowing companies to conduct their lawful business, as well as keeping an important emergency services route open. “Where people do have concerns about the actions of the police, there is a robust complaints procedure in place, overseen by myself. He said Lancashire police had upheld just five complaints about its Preston New Road policing operation, out of 217 complaints, between January 2017 and last month, while there had been 434 arrests and 429 charges. Meanwhile, the IOPC has confirmed that it failed to uphold an appeal by wheelchair-user Nick Sheldrick after Lancashire police had rejected his complaint, following an incident in February, and found that his complaint “had been properly addressed and all appropriate lines of enquiry had been followed”. 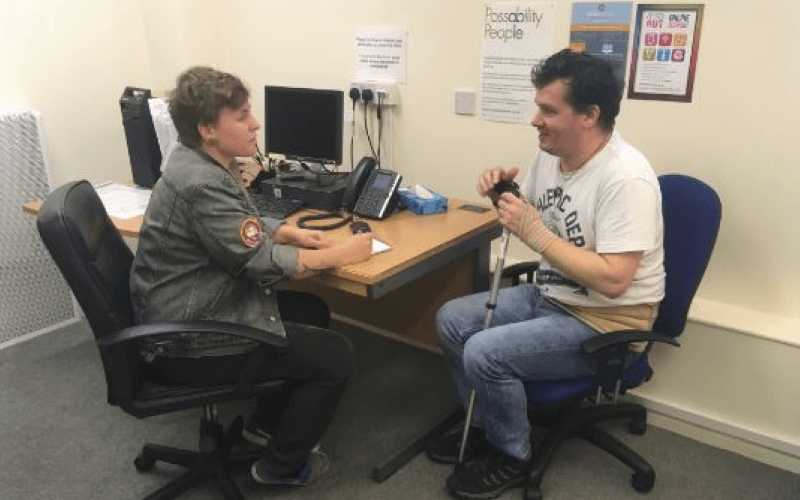 Last week, Sheldrick told DNS that he had been tipped out of his wheelchair six times by police at Preston New Road and believes that only one of these incidents was accidental. But the IOPC did uphold a single complaint earlier this year by another protester that the force should have recorded their complaint. An IOPC spokeswoman said: “We take incidents where it is alleged someone has suffered a serious injury as a result of use of force, or has been discriminated against, very seriously. “We do not have any independent investigations relating to the incidents reported. “We are aware of the anti-fracking demonstrations, as reported in the media, and we have recently been in contact with Lancashire Constabulary. “The force has assured us that any complaints received have been dealt with appropriately, and did not meet the criteria to be referred to us. Lancashire police said last week that its intention was to “ensure a consistent and coordinated policing response and ensure a balance between the rights of people to lawfully protest, together with the rights of the wider public, including local businesses, to go about their lawful activities.